Edith May Dempster was born in Yorkshire in 1883, the daughter of wealthy industrial manufacturer Robert Dempster and his wife Elizabeth. In 1894 at the age of 11 she was sent to Wimbledon House School in Brighton, a school run by three sisters Penelope, Dorothy and Millicent Lawrence along somewhat progressive lines, preparing girls for entrance to the newly opened Girton and Newnham Colleges at Cambridge. During her time there the school moved to its new premises on the outskirts of Brighton and became known as Roedean. Leaving Roedean in 1899 she spent the next few years travelling extensively with her parents, including trips to Egypt, Italy, France, the USA and the West Indies, and in 1901 she spent six months in Paris “to improve her French” with a friend Isabel and a governess. One result of the Industrial Revolution was a new breed of men who had earned huge amounts of money in their business but did not have the social standing of the original landed gentry, and Robert Dempster was no exception. In 1907 Robert leased the great house of Vale Royal from Lord Delamere who was by this time living in Kenya. The family`s occupation of Vale Royal is chronicled in the reminiscences of Mary Dempster who lived there with her grandparents and she makes several references to “Aunt Edith”. Edith had her own personal sitting room situated in the north wing of the house which, according to Mary was “a huge cold room looking north and west and crammed with her immense collection of bibelots from all over the world”. The room was as far as it could be from the rest of the household and as she used to stay up late at night she kept a revolver in a drawer of her desk. Young Mary thought that “she was very plucky. I wouldn`t have sat there alone after dark for anything”. 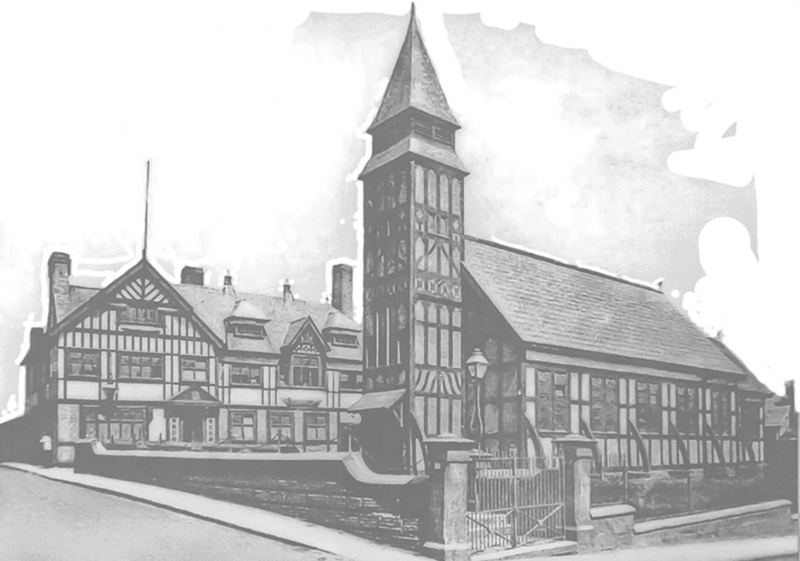 Following their arrival at Vale Royal the family continued their trips to Europe and Egypt, and the life led by Edith would have been worlds away from the lives led by young women in the nearby town of Winsford. The vast house was cared for by a full complement of household staff, including a butler and a housekeeper and numerous housemaids, lady`s maids, kitchen and scullery maids and footmen. According to young Mary Dempster, a man named Mr Oram came from Northwich twice-weekly to wind all the clocks, a task which took four hours. Tending the fires in the winter must have been a full time job as nine reception rooms and all the occupied bedrooms had fires as well as the nurseries and senior servants` rooms. Outside, the extensive grounds were cared for by eighteen gardeners under a head gardener who lived in his own villa in the grounds. The stables contained a mix of horses and motor cars, looked after by two chauffeurs and a groom, and a page boy employed to open gates on trips. Edith had two or three hunters of her own and enjoyed the Cheshire Hunt. Several photographs show her in the grounds with her horses. It should not be assumed, however, that Edith led a spoiled or feckless life. She was a JP, and was involved with several Winsford groups, including the Amateur Theatrical Society, the Nursing association and the Albert Infirmary. When the First World War began she became quartermaster of a Red Cross military hospital, and served with the Red Cross in France for which she was awarded the Victory Medal and the British War Medal. After the war Edith returned home to continue her community work, but her mother sadly died in the early months of 1919. According to the terms of Elizabeth`s will written in 1912, Edith received all of her mother`s Russian sables and shared the rest of her furs, jewels, lace and personal possessions with her sister Elizabeth (who had by this time married Hants M.P. Frank W Perkins). Edith remained at Vale Royal with her father. During her time at Roedean Edith had met Frank Pretty, the brother of her friend Mildred Pretty, and the couple had corresponded throughout the war. A family story states that Frank proposed to Edith on her eighteenth birthday and every year thereafter. It has been suggested that she did not accept out of a sense of duty to her father, but her refusals had started well before her mother`s death. It has also been suggested that Robert would not have approved of the marriage as he hoped for marriage into the aristocracy for at least one of his daughters. Whatever the reason, it was not until 1926 that Edith married Frank, the year after her father`s death in South Africa. The couple were married at the parish church of Whitegate on the 8th April, when Edith was 42 years of age, and Frank was 5 years older. The newspaper carried a report of the event. The marriage of Colnel Frank Pretty, T .D., late of the 4th Batt. Suffolk Regiment, and Miss Edith M Dempster, daughter of the late Mr and Mrs Robert Dempster, of Vale Royal, took place at Whitegate on Thursday. Miss Dempster has for years filled the role of “a bountiful fairy”, and her interest in all works of a charitable nature has won for her the highest regard. In connection with such objects as the Nursing Association, the Albert Infirmary, the Hospital Saturday Committee, and numerous other organisations, her interest has not merely been that of a donor or subscriber, but has taken shape in actual hard work and organisation. The bridegroom, Colnel Pretty, T.D., resides at Beacon Hill, Ipswich, and is a director of a company of manufacturers. The picture presented by the bridal party was one of rare beauty. The bridesmaids were the Misses Perkins, nieces of the bride, Miss Sylvia and Miss Molly Yates, nieces of the bridegroom, Miss Barbara Heywood and Miss Margaret Dempster, cousins of the bride; and Miss Diana Heywood , cousin of the bride, was the train-bearer. The bride was dressed in white and gold, with a gold tissue train, trimmed with lace, and she carried a golden bouquet. The bridesmaids were all attired in blue georgette, with lace and sable trimming, and they wore beige hats, trimmed with blue flowers, and they also carried golden bouquets. Sir Arthur Churchman, M.P. was the best man, and the service was conducted by the Vicar, the Rev. E. A. McComas. Colonel and Mrs Pretty left later for the New Forest. The couple moved down to Ipswich and Vale Royal was vacated. Robert Dempster had left an estate of £518,819 17s which was divided between the two sisters, making them both wealthy ladies. Before she left the area, one of Edith`s last contibutions was to give a silver cup, the Dempster Challenge Cup, which was awarded to Joseph Bratt in 1926 for the best kept allotment at Over Allotment Site, Moss Bank, a prize still valued today. At the comparitively late age of 46 Edith became pregnant, and a son Robert was born in 1930. Sadly just four years later Frank was diagnosed with stomach cancer and died three days after Christmas leaving Edith with a young son. The couple had by this time bought a new property near Woodbridge in Suffolk. Following Frank`s death Edith had become interested in spiritualism and eventually became fascinated by numerous mounds in the grounds of the property. Various trips to Egypt with her parents, and her father`s excavations at Vale Royal had left Edith with some knowledge of archaeological research, and in 1937 she decided to engage the services of Basil Brown who had worked for Ipswich Museum. He began working in June 1938 with a wage of 30 shillings per week plus his accomodation. Early results were not encouraging as the first mounds to be investigated had all been robbed out and only fragments were left. In May 1939 work began on a large mound with Basil assisted by Edith`s gardener, her gamekeeper and another Vale estate worker, resulting in arguably the most important find in British Archaeological history – the Sutton Hoo Burial ship. This Anglo Saxon ship burial has shed light on the so-called Dark Ages, demonstrating a very high level of craftsmanship and creativity previously unknown. Mindful of the previous grave robbing which had taken place, the discovery was held in great secrecy, but following the premature announcement by a member of the Museum, se curity became a great issue. Edith personally paid for two policemen to guard the site, mainly to keep all the reporters away. Many of the treasures spent their first night after discovery under Edith`s bed, then they were packed up and sent to London. A great debate broke out regarding the ownership of the priceless objects. Had they been temporarily concealed for retrieval later, in which case they belonged to the nation? Or had they been buried permanently in which case they would belong to the landowner who found them? Obviously, as they were part of a burial site it would not be expected that they would be retrieved and so an inquest at Sutton village hall decided that the treasures did indeed belong to Edith. Fortunately Edith decided to present them as a gift to the nation and they were taken to the British Museum. It was fortunate that the work was done before war broke out as both the house and grounds were requisitioned for army training in 1943 and the site was used as a firing range. Edith had gone to stay in Surrey where she unexpectedly developed a blood clot on the brain and died on 17th December 1942, aged 59 years. She is buried in Suffolk.